of cricket, but also by bringing in new activities such as code-breaking and cryptology, which proved very popular and in which Hymers began to enjoy some success. His assemblies were always very memorable too: he was never afraid to talk honestly about his personal passions (from cycling to pop music) or express his personal views, with his words always supported, of course, by studious research and well-presented visuals. 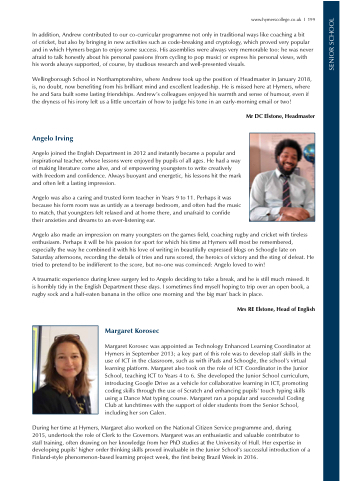 Wellingborough School in Northamptonshire, where Andrew took up the position of Headmaster in January 2018, is, no doubt, now benefiting from his brilliant mind and excellent leadership. He is missed here at Hymers, where he and Sara built some lasting friendships. Andrew’s colleagues enjoyed his warmth and sense of humour, even if the dryness of his irony left us a little uncertain of how to judge his tone in an early-morning email or two! Angelo joined the English Department in 2012 and instantly became a popular and inspirational teacher, whose lessons were enjoyed by pupils of all ages. He had a way of making literature come alive, and of empowering youngsters to write creatively with freedom and confidence. Always buoyant and energetic, his lessons hit the mark and often left a lasting impression. Angelo was also a caring and trusted form teacher in Years 9 to 11. Perhaps it was because his form room was as untidy as a teenage bedroom, and often had the music to match, that youngsters felt relaxed and at home there, and unafraid to confide their anxieties and dreams to an ever-listening ear. Angelo also made an impression on many youngsters on the games field, coaching rugby and cricket with tireless enthusiasm. Perhaps it will be his passion for sport for which his time at Hymers will most be remembered, especially the way he combined it with his love of writing in beautifully expressed blogs on Schoogle late on Saturday afternoons, recording the details of tries and runs scored, the heroics of victory and the sting of defeat. He tried to pretend to be indifferent to the score, but no-one was convinced: Angelo loved to win! A traumatic experience during knee surgery led to Angelo deciding to take a break, and he is still much missed. It is horribly tidy in the English Department these days. I sometimes find myself hoping to trip over an open book, a rugby sock and a half-eaten banana in the office one morning and ‘the big man’ back in place. Margaret Korosec was appointed as Technology Enhanced Learning Coordinator at Hymers in September 2013; a key part of this role was to develop staff skills in the use of ICT in the classroom, such as with iPads and Schoogle, the school’s virtual learning platform. Margaret also took on the role of ICT Coordinator in the Junior School, teaching ICT to Years 4 to 6. She developed the Junior School curriculum, introducing Google Drive as a vehicle for collaborative learning in ICT, promoting coding skills through the use of Scratch and enhancing pupils’ touch typing skills using a Dance Mat typing course. Margaret ran a popular and successful Coding Club at lunchtimes with the support of older students from the Senior School, including her son Galen. 2015, undertook the role of Clerk to the Governors. Margaret was an enthusiastic and valuable contributor to staff training, often drawing on her knowledge from her PhD studies at the University of Hull. Her expertise in developing pupils’ higher order thinking skills proved invaluable in the Junior School’s successful introduction of a Finland-style phenomenon-based learning project week, the first being Brazil Week in 2016.